Hmmm....let's see...I hit week twelve. Not really much weight gain there. Nausea??? Oh my gosh, yes! Some days were so bad, mostly nights though. Only vegetarian foods were welcomed without making me sick as a dog. Not that I mind though, I have always wanted to go full vegetarian. Maybe this is the push that I needed! I did gain a pound, but still under my pre-pregnancy weight. Around this time when I was pregnant with my son, I had already started to gain a lot more, but it was because I felt the need to eat more just because I was pregnant. Also, I didn't have the same healthy eating habits back then. What's going on with baby right now? Well, he/she is developing it's reflexes! Baby is about the size of a little lime- about 2 inches long from head to toe. I'm not going to lie, I can seriously feel more and more flutters. Early, yes, but my OB/GYN did say it's possible, especially for subsequent pregnancies. Yeah, so that's my belly at 13 weeks pregnant. 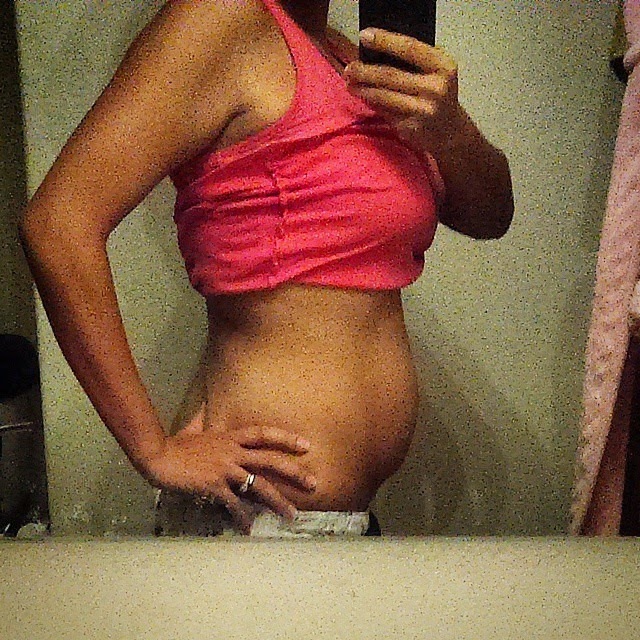 More bloat in that photo, but not a baby bump yet. It fluctuates DRAMATICALLY as the day progresses. Still suffering from morning sickness and evening sickness. Can't wait till that disappears!!!! My husband and I went out for date night at the Olive Garden and I couldn't believe how different everything tasted. I couldn't even stomach some of the sauces on the pasta that I normally like. However, my morning sickness wasn't as bad as last week. Yay, so it might be subsiding quite a bit. The least fun part right now besides the occasional puking is the round ligament pain in my sides. Ouch. The dreams I have at night are just getting weirder and weirder. I've had dreams of a baby boy and a baby girl. My baby can usually talk. It's a little scary. What's going on with baby? Baby is the size of a peapod- 3 inches long from head to toe and weighs about an ounce.